Calories Count has your health in mind. It’s a free resource which aims to help people slim down and eat healthily, with a little regular exercise to keep your heart pumping. There’s nothing too revolutionary here, just simple exercises and recipes, plus a few tools to help you keep on top of the mathematical side of checking your progress. 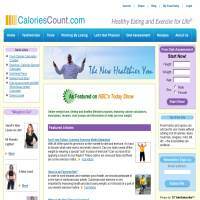 CaloriesCount.com is broken into sections to help you find what you’re looking for, although they don’t always make a great deal of sense. Once you’ve looked around for a little while you’ll be able to navigate without too much trouble, moving between your food diaries and checking calories for what you’re about to eat. There are two primary calculators to use: a food calorie calculator and an exercise calorie calculator. Inputting the basic food items, the system works out how many calories are in your meals. This can, however, be a somewhat long process if you’re making everything from scratch. It would have been useful to be able to just paste a list of ingredients into the search box, and have the system calculate it. However, that tool is rare to find and isn’t always accurate. The exercise calculator is interesting because it takes several important factors into account: the kind of exercise, the duration, and your weight. Consequently, it understands that the same exercise won’t burn as many calories in a lighter person as it would in a heavier person, which is really important to people who wish to lose weight. There are 6 weeks’ worth of diet meal plans, which is a good base to get you started at. This also saves you from having to work out all the calories in each dish. You can choose from regular or convenience meals, depending on how much time you wish to spend cooking. In addition, you can choose how many calories you will consume each day, which is great if you’re willing to start off low and work your way up. In the past, we’ve been a little tough on Calories Count. However, we now feel they provide a valuable free resource which could help a lot of people lose weight. It’s not the easiest website to use, and the tools are a little underdeveloped, but they do work with a little persistence. If you don’t have much money to spend, enjoy cooking and want to take advantage of some free recipes and exercise schedules, Calories-Count could be the site for you.